Couldn’t get the tailgate organized? No problem. Hit Klement’s Sausage Haus on the edge of the east parking lot where they have brats, sausages, beer and other items for an impromptu tailgate. … Encased meats are the stars inside the park, too, including brats, Italian, Polish and Chorizo sausages, as well as hot dogs. All should be smothered in the Secret Stadium Sauce. … While Miller products are obviously plentiful inside, beer drinkers will be happy to learn that there’s also a wide assortment of imports and excellent local microbrews, too. Try a Sprecher or New Glarus, both Milwaukee favorites. … Be in your seat in the middle of the 6th inning for the Klement’s Famous Racing Sausages. Choose between the Bratwurst, Hot Dog, Polish, Italian and Chorizo, and bet your buddy on the outcome. Pick the right sausage and the next round’s free. … Check out Bernie Brewer hanging out in his ‘Dugout’ above the left-field bleachers. He still goes down a slide whenever a Brewer hits a home run, but gone is the stein of beer he used to end up in. 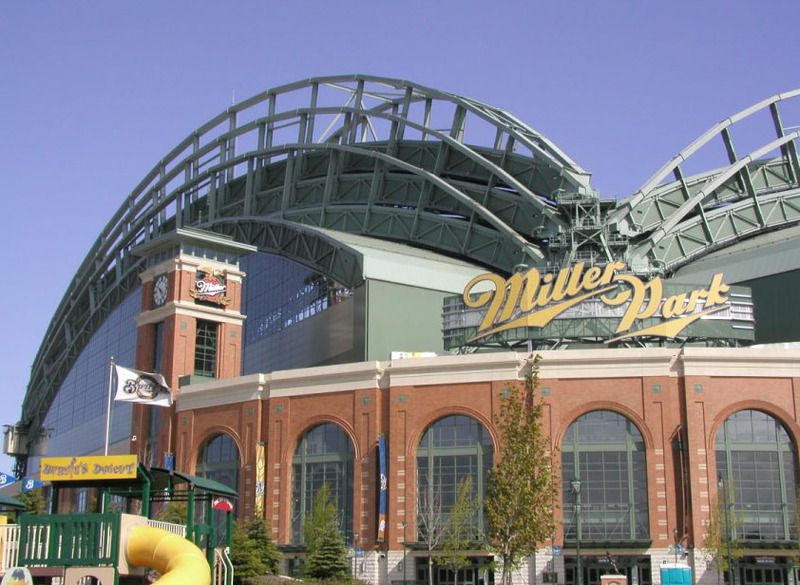 Contemplate that as you choose from the wide variety of beer at Miller Park. … After the game, retire to the parking lot, fire up the grill again and crack open those beers you wisely left on ice. Many fans wait out the traffic with some post-game tailgating. … Another good option is to head to Bluemound Road north of the park just across I-94, where there are various restaurants and taverns to choose from. Many of these establishments run shuttles to and from the game, which is nice. Try Kelly’s Bleachers or Long Wong’s, which touts itself as “the world’s greatest Chinese-American sports bar.” … Milwaukee may have an impressive art museum downtown on the lakefront, but beer lovers seeking some culture will want to stick close by. The Miller Brewery is just north of the park, and tours are offered.